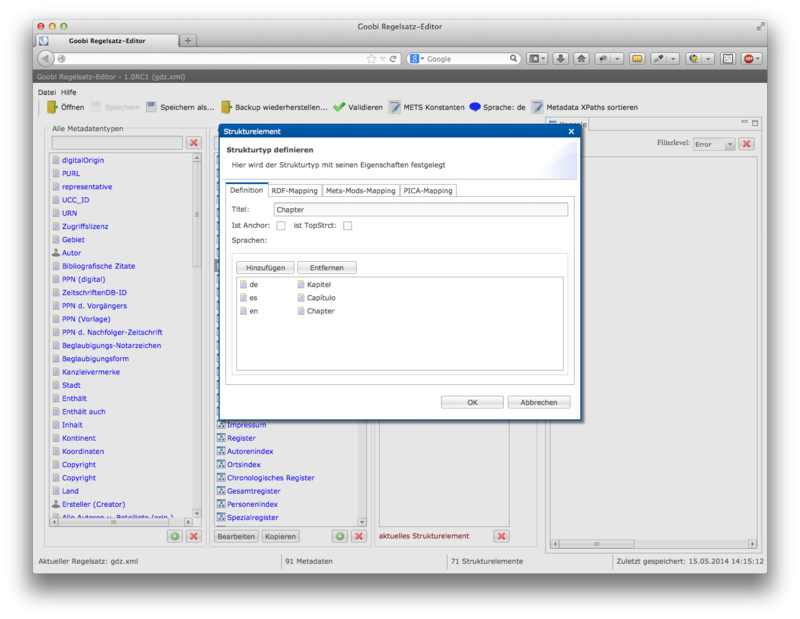 The intranda ruleset editor can be used as either a desktop or web application. Used as a web application, you avoid the additional time involved in working with complex XML files via a terminal connection. Instead you have a user-friendly interface that presents all the information you need clearly while ensuring that your results are free of errors. Once you have saved a ruleset, it is available immediately for use in Goobi. The ruleset editor is divided into several sections, all of which are clearly separated to ensure that you have a good overview of the data and can edit as required. 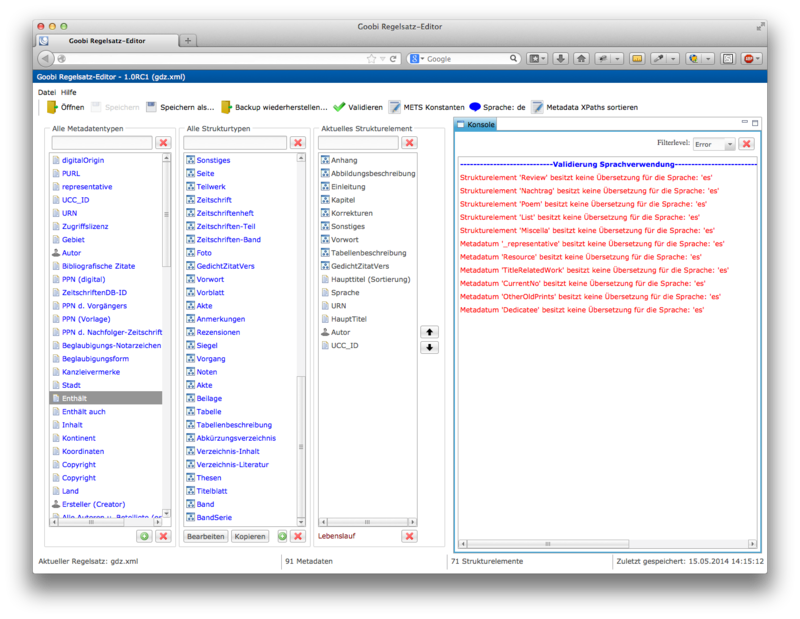 All types of metadata and structure data (and combinations of the two) are shown separately. You can add new elements simply by selecting the corresponding button. A series of dialogue boxes guides you through the individual configuration options and offers useful defaults and explanations to help with data entry. You can drag and drop metadata elements or structure types into other structure types using your mouse. If the ruleset becomes very large, you can locate the elements using the search fields at the top. If you have a number of rulesets, or if you cooperate with other partners within the Goobi Community, everyone can benefit in the long term by sharing. 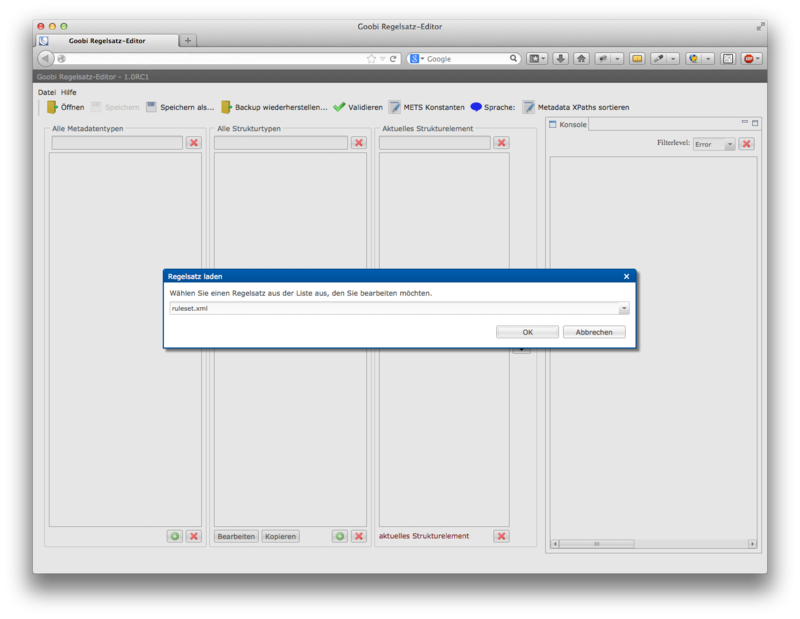 The ruleset editor allows you to edit several rulesets and at the same time import configurations from other rulesets. This makes it very easy to ensure that results are uniform across different rulesets. The structure of rulesets is complex and allows for highly individual and granular configurations. In many cases, these will have been put together painstakingly and in great detail over a long period, so it is important to handle them carefully. For this reason, the ruleset editor will generally create a back-up copy of the files it has been used to edit. As well as creating automatic back-ups, the ruleset editor comes with one other important function that makes it even more reliable. The user can call a number of validators that will subject the rulesets to a thorough examination including checks for correct configuration, missing data, superfluous elements and translations.